A car without tires is useless compared to a car without an engine. Seriously, you can't even tow a car without tires. Unfortunately, people quite commonly overlook the importance of tires. This is the reason why many people continue to drive their cars on decades old ones. This can be potentially dangerous for the car, the driver and other vehicles on the road. So, you must be able to determine how old your tires are and when you must replace them. How Long Does a Tire Live? Most experts and manufacturers maintain that a tire can only live up to six to seven years. However, depending on the conditions it is kept or driven under, this age can minimize down to four years or maximize up to ten years. As they are made of rubber, they eventually start to degrade. This does not only hamper the quality of ride and the performance of your vehicle, it can also put your life in great peril. One very important think you must remember is that the ‘actual' age of your car's tire cannot be determined from the day it hit the streets but from the day it gets off the production line. This is because many tires spend years in the warehouse and then a few more on the dealer's shelf. Most warehouses lack any protection from climatic and whether conditions. This puts the tires almost in the same position as they would have faced in the parking lots and garages. Moreover, rubber itself is not among the most long-lasting materials. It has a specific life span, and so do the tires. So, whether the tires are in the warehouse or on the roads, aging is inevitable. What you must look for should be the actual age of your tire rather than the time it has been running on roads. Before we go on discussing the methods of finding out your tires age, let us understand how dangerous old tires can be. The most prominent sign of aging tires is the tread wear. When your tire treads start to wear out, your tires will lose their capability to perform well and safely during extreme weather conditions. As the rubber starts to degrade, tires start to lose their elasticity and grip. While there is a fat chance of tires busting during a speedy drive on a hot summer day, there is also a wide chance of losing control of the vehicle in a snowy weather. Also, old tires badly affect the braking capability of your vehicle. As the tires have lost a good amount of their grip, your car brakes won't be as responsive as they should be. Consequently, you have very little chance of escaping sticky situations on the roads. 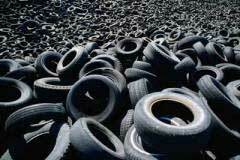 There are many incidents of fatal accidents due to inefficient and aged tires. That is why many states have certain laws regarding the age of tires and insufficient treads. How to Determine the Age of a Tire? Despite all the myths regarding how manufacturers try to conceal the age, finding the actual age and date of manufacture is quite easy. Take a good look at your tire and you will find a Department of Transportation (D.O.T) stamp. You can easily decipher the date of manufacture through his DOT stamp. For all tires manufactured in the 90s, the last three digits define the week and year of manufacture – last one for year and first two for the week. For instance, if the last two digits are 527, it means that your tires were manufactured during the 52nd week of the year 1997. For tires manufacturer in the 2000s, it is the last four digits you should look for. First two digits define the week and the last two reveal the year. In case you are not able to find such a code, which is not quite possible for tires manufactured after 1990s, here is an easy DIY trick for US drivers. Find a Penny and try inserting it into the tread with the head of Abraham Lincoln being buried into the thread. If you are able to see the head, time to change tires. If not, they are still good for may be a year or two. Also, check out the DOT for each tire of your car. It is not necessary for a car to have all the tires of same age.